It’s been three months since I last posted a blog. I know I know… shame on me. I don’t think I need to explain what exactly I’ve been doing these past three months that’s kept me from writing this blog. I’m sure you all know by now that beyond finishing my second year of university, me and three friends have written, rehearsed and put together a one hour stage show for the Edinburgh Fringe festival which we will be performing at the festival in three weeks. On the whole it’s been an odd experience. Unlike anything I have ever done before. Well, except for the writing part, I’ve kind of done that before. So I figure my first blog back should explain exactly what I have been doing these last three months. Now if I’m honest, I can’t imagine this is going to interest that many people. So feel free to click that little x in the corner of your browser now if you don’t really care about the process of creating “Placement Crisis”. Because I really can’t imagine I’m going to be able to retell these events in a way that particularly entertaining. I promise a more entertaining blog in the next day or so, but right now. I wanna get all this down as a record of the last couple of months of my life. Particularly the last 7 weeks. So during our final month of university (May) me and the other guys putting on the show held several meetings, but found that they tended to quickly deteriorate from us discussing ideas for sketches into youtube sessions where we would just end up showing each other our favourite sketches from other sketch shows via the web. It seems we were all so busy working on our final projects and essays for our course that we simply couldn’t bring ourselves to give up what little freetime we had for more work. But we kept trying never the less. We all had a couple of ideas, tried a few more meetings and were working on bits and pieces of ideas while we finished up the year, but ultimately it was futile, we were simply too busy to get any real work done. On May 27th we did one of the final pieces of work our university required of us (A pitch). And the very next day we had what I considered to be the first real and productive meeting. We discussed everything from the content and tone of the show to the press release and photoshoot. This meeting is also significant as the first moment I regretted my decision to be apart of this project. For the benefit of those of you who don’t know me personally, over the past 2 years I have gained two stone in weight. And for those of you who haven’t seen me recently, in what appears to be some cruel practical joke being played on me by the universe, all that weight appears to have gathered on my face. As someone who has never had an issue with weight, I wasn’t used to it and the sudden image of me with 18 chins was more than upsetting, it was downright horrifying. Don’t believe me? Allow me to demonstrate. 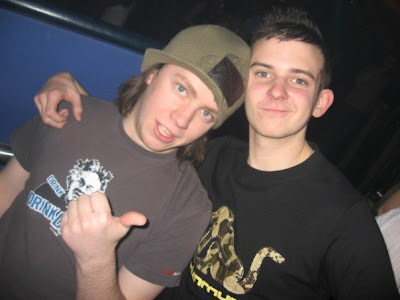 This is a picture of me drunk in a club in 2006 with my friend Simon. 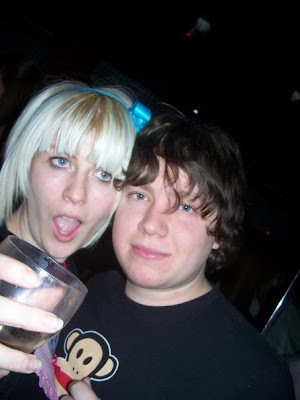 This is a picture of me drunk in that same club in 2008 with my girlfriend Nadia. And now I have to do a photoshoot looking like I do these days? Not impressed. But my current appearance wasn’t the only reason that a photoshoot was a problem, a day before we had discovered an old email informing us that we only had till the 31st to send off our press pack to the people organising the festival. Giving us only three days to take the photos, edit them into posters, write a press release and send it all off. Wow, how well organised we all are. It all felt like a bit of a sham at this point… we had barely met, we had barely written anything and now we had discovered our inadequacies had led to us forgetting to do one of the most important tasks in this whole thing. Without the press pack how could the show be advertised, how would anyone even know it exists? So, the very next day, the 29th, we found ourselves sat in Tom and Chris’s house on Evelyn road converting it into a set and having our picture taken. With a day notice we had managed to hire a photographer thanks to a contact supplied to us by a friend. 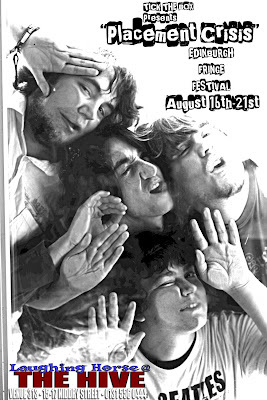 We couldn’t think of anything particularly original to do with our poster in the short amount of time we had, so we just ended up simply taking some pictures of ourselves and making them look as “Studenty” as we possibly could. Which has kind of become the theme of our show. We also took several pictures with our faces pressed up against the glass doors of the house with the intention of making them look like we had shoved our heads in a photocopier using Photoshop later. This of course never quite turned out as we planned, but did look pretty good in the end. We then spent the following day (The 30th) editing the pictures and writing the press release. Finally we sent it all off via email on that evening, a whole 24 hours before we had to. It didn’t look great, nor was it particularly well written, but it was done, and we were finally starting to chip away at the mounds of stuff we had to do. I can’t find the press release we sent of on that day on my laptop, but here are the posters. So after that we decided the best thing to do was to each go away and write some sketches individually that we would later edit as a group. This was largely unsuccessful. By the 4th of June when we next met, we only had three or four sketches between us. Only one of which was ready enough for us to do a table read of. That was the final straw, we needed to focus, we needed to knuckle down and get to work. We needed at least 15 sketches for the show and had previously decided we should write about 40 so we could guarantee the best quality material would get into the show. The problem was that from that day (the 4th of May) we had only six weeks left before we had to move back to our homes (The 19th of July) and would be separated an unable to work on the show, so even though the show itself was 10 weeks away, we had to be ready to perform in six. We decided to not have a meeting for an entire week. Now this may seem like a stupid idea, it may seem counter productive, but we decided that if we all went off and spent the week focusing on writing 10 sketches each we would have 40 sketches and be able to start the group editing session one week later. Just two days later I moved into the house that Chris and Tom lived in as this had become our regular meeting place and it seemed like the logical thing to do since they had a spare room going. Oh yeah, that, and I got kicked out of the place I was actually living. So you know… it made sense. On the 8th of May Chris checked Chortle.com (As he often does) to see what was happening in the comedy world only to discover the website was now doing a feature on this years Fringe line up. And sure enough there it was. Listed with one of the images we had taken just two weeks before. Placement Crisis. This was both a glorious and terrifying moment. Suddenly the whole show was very real. Much realer than it ever had been before. It was suddenly dawning what we actually had to do. And it couldn’t of come at a better time, it really motivated me to work hard during that week. So a week after our last meeting on the 12th of June we gathered (Which wasn’t so difficult for me since I now lived about 20 seconds away from the meeting place) with our sketches (On average about 9 each) and spent the entire day going round the room one by one reading them out to each other. The original plan was to choose our 15 there and then. Meaning that when we next met we could start the editing and cleaning up process for those 15 as a group. But we didn’t feel confident. I think we all knew we only had about 7 or 8 really solid sketches between us. And that wasn’t good enough. We decided to give ourselves two more days to each write 4 more sketches. Of course due to someone being busy we ended up extending that gap to three days and didn’t meet up again till Tuesday the 16th. This turned out to be an excellent idea. The sketches people brought to this meeting turned out to be stronger than most of the material we had presented a few days before. Now in total we had roughly 50 sketches. And by the end of that day, we had chosen 18 sketches. The 18 sketches we intended to feature in our show. We met up every day for the next three days and spent hours and hours editing each chosen sketch one by one. Adding jokes, improving dialogue, cleaning up stage directions and generally making them better. 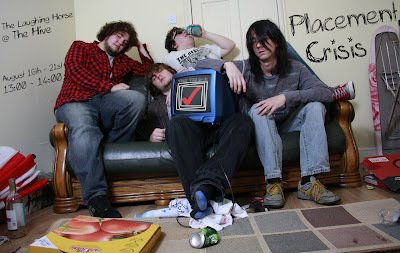 During this process we even decided to loose a sketch I wrote entitled “band”. There were several problems with that script, but the main reason was it simply didn’t feel as strong as everything else we had written. So the end of the week came and there it was. 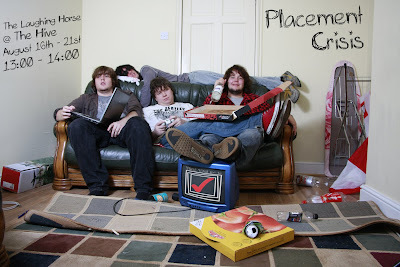 On the 12th of June I was holding in my hand a 17-sketch script entitled “Placement Crisis”. And that’s when it began. After two days off (The 15th of June) we were meeting again, doing our very first table read through of the show. It was exciting. Very exciting. We decided we would do four days of table reads, recording them in the day and reviewing the recordings in the evenings to help us lean the lines as fast as possible. After several 9+ hour days we took a couple of days off. On Monday the 22nd we had our first rehearsals. This was where I really felt out of my depth as someone with only limited experience acting. It was more time consuming than I ever imagined it could be as we had to block out the sketches bit by bit, working out the positioning of the characters and moves around the stage. But it had to be done, and it gave us two extra days to get more familiar with our lines. In the end this process felt very valuable, and it was also exciting to finally get to deliver this dialogue while acting. By Wednesday the 24th we had all learnt our lines and the show was really starting to come together. Now we had just three weeks to go over and over the show until we had perfected our performances and knew all the steps and lines off by heart. Every day from 10 o’ clock till 7 o’clock we ran through the show over and over again until we were sick and tired. Sick of the rehearsals, of the house, of the material and if I’m honest, sick of each other. The rehearsals were so tedious that despite the fact that lots of things happened during those three weeks, there is really nothing to say about them. Other than the fact that everyday we ran through the show as many times as our exhausted bodies would let us. The show became my life, I was waking up, performing, eating, sleeping and then starting the cycle all over again. That’s all I seemed to be doing. It was one of the toughest few weeks of my life. About a week before I returned to Manchester for some well deserved rest we finally got the props and costumes sorted and got to do a full week’s worth of dress rehearsals, which were very exciting. And now we are read. Ready to have a few weeks off so when we go to Fringe we are rested up and ready to kill it! So, that’s what happened. A week ago I moved back to Manchester and have been catching up on sleep since. Sorry this was so long and boring. If you managed to read the whole thing I salute you.